Reality Check: Which EU countries have the most UK citizens? The question: Alex emailed the BBC to ask "How many UK citizens live outside of the UK in the EU?" The answer: Just under 1.2m live in other EU countries, according to the most recent available data, with the largest group of citizens living in Spain. After we looked at which EU countries have the most citizens living in the UK, some of you got in touch to ask how many British people live in other EU countries. There were just under 1.2m UK citizens living in the rest of the European Union in 2015, according to data collected by the United Nations. 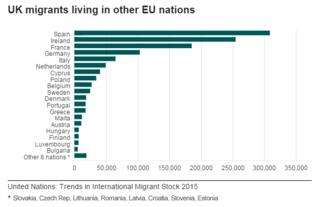 Of the 27 EU countries, Spain had the most with just under 310,000 migrants from the UK living there in 2015. Ireland was second with 255,000 and France third with 185,000. The UN gathered these figures using census data and other national population surveys. The UN data isn't perfect - some countries count international migrants by birthplace while others judge it by the passport someone holds. But they are the best figures we have for comparing migrant populations across the globe. Although Spain was the most popular country of residence in Europe, it was not the first-choice home for UK citizens living abroad in 2015. There were 1.3m UK citizens living in Australia, 715,000 in the United States and 607,000 in Canada. South Africa was next with 318,000 and then Spain. Reality Check: Who sets the UK's immigration policy? Reality Check: Which EU countries contribute most to UK population?